A Russian Soyuz rocket carrying NASA astronaut Nick Hague and Russian cosmonaut Alexey Ovchinin launches skyward from Baikonur Cosmodrome in Kazakhstan on Oct. 11, 2018. The mission suffered a failure while in flight, leading to a dramatic launch abort for the crew. Leroy Chiao is the CEO and co-founder of OneOrbit LLC, a motivational, training and education company. He served as a NASA astronaut from 1990 to 2005 and flew four missions into space, as a crewmember aboard three space shuttles and as the co-pilot of one Russian Soyuz spacecraft launched to the International Space Station. After that flight, he served as the commander of the station's Expedition 10, a 6.5-month mission. Chiao has performed six spacewalks, in both U.S. and Russian spacesuits, and has logged a total of 229 days in space. Chiao contributed this article to Space.com's Expert Voices: Op-Ed & Insights. The Soyuz rocket will be grounded until the root cause of the failure is determined and a fix is put into place. It is unknown how long this process will take, but the clock is ticking. The Soyuz MS-09 spacecraft currently docked to ISS arrived in June of this year and has a 200-day certification life. So, the rocket must be cleared to fly before then; otherwise, we will face leaving the ISS without a crew on board. 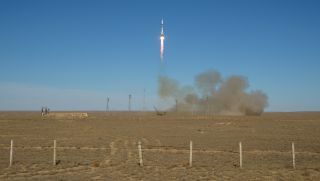 Seven years ago, on Aug. 24, 2011, the launch of Progress 44P (also from the Baikonur Cosmodrome in Kazakhstan) failed after the third stage of the Soyuz rocket carrying the freighter suffered its own failure. Pieces of the failed launch were recovered some 40 miles (64 kilometers) north of the Chinese/Siberian border in a wooded area. After that mishap, the Russians were able to complete their accident investigation and recertification efforts in time for the next crew to launch to ISS, thus avoiding leaving the station vacant. Soon after both mishaps, news outlets quickly quoted NASA as saying that the events would have no significant immediate impact on the crew aboard the ISS. Those astronauts had adequate supplies and resources to continue their missions, NASA said. Although true, such statements miss the point. These two close calls highlight poor policy decisions. If the ISS has to be left without a crew aboard, this could be a serious problem. That's because a number of events could cause the ISS to lose attitude control. Why is this important? When a structure like ISS loses this control, the object tumbles. When there is a crew on board during these events, they run the procedures to re-establish control. This is not such a big deal. Without a crew however, the antennas would quickly lose a signal lock with mission control, and the ISS computers would fail to receive commands from the flight controllers. The solar arrays would no longer point at the sun correctly, and the storage batteries would run down. The ISS would slowly die. It would not be possible to safely attempt a docking with a tumbling station, so a new crew would not be able to get aboard to rectify things. The ISS would slowly lose altitude and re-enter the Earth’s atmosphere in an uncontrolled manner. We and our international partners would lose the 100-billion-dollar-plus facility. Large pieces would survive the re-entry and could cause significant damage upon hitting the Earth. The big deal is the collective dependence of all ISS partner nations on the Soyuz rocket and spacecraft for carrying crew to and from the station, which has been the case since the end of the space shuttle program in 2011. The United States willfully and knowingly made this decision in 2004 under President George W. Bush’s administration after the Columbia shuttle accident. President Barack Obama's administration confirmed that decision in 2009, rejecting an option in its space policy to continue flying the space shuttle through at least 2015. Both administrations pointed to rosy projections on when new U.S. vehicles might come online. Not surprisingly, all of these vehicles are still in development years after their projected dates. Russia and Canada made informal but public calls some years ago for bringing China and its Shenzhou spacecraft into the ISS program. However, certain powerful, Sino-phobic and arguably short-sighted members of the U.S. Congress blocked those proposals. Under the current U.S. administration of President Donald Trump, the U.S. is supposedly heading back to the moon. However, as during the Obama administration, there is no program for accomplishing this. Without adequate yearly funding commitments, there could not and cannot be a program, then or now. One of the cornerstones of the current space policy is to somehow "privatize" or "commercialize" the ISS by 2024-2025 and to use the "savings" from that privatization to help fund the program. The idea of operating the ISS profitably is so preposterous that I don't feel a need to comment further here. Besides, from where is the funding to come before 2024-2025? What this look back shows is consistently poor policy decisions going back at least 14 years. What will happen to NASA and U.S. spaceflight in the coming years? I don't think anyone can say. The bright spots (and wild cards) are SpaceX and Blue Origin. Led by visionaries who have the resources and commitments to fund exploration and infrastructure development, these companies are building and launching hardware. They have plans to accelerate these activities around the Earth, the moon and even Mars. There has been talk of NASA and the U.S. government partnering with these companies in bigger ways, to jointly explore space and build space infrastructure. I think this approach has real merit and possibilities. But the devil is in the details, and I will try to remain optimistic despite a disappointing 14 years and counting. You can read more of Chiao's Expert Voices Op-Eds and film reviews on his Space.com landing page. Follow us @Spacedotcom and Facebook. Original article on Space.com.